The last decade of this technologically advancing 21st Century saw the exponential rise in the number of mobiles phones operating and the major part of this number is comprised of the so-called ‘smart’-phones. As of 2011, smart-phones accounted for above 35% of the total telephones in the world and this figure rose to 56% in 2013 and the same ascent is anticipated in the years to come. But what makes these phones smarter than the orthodox communication devices? Well, according to Wikipedia, a smart-phone distinguishes itself from the normal phone by the features it provides like Wi-Fi, touch-responsive interface, media player, digital camera and third party applications. But recently, all of these different attributes of the Smartphone except one have been experiencing saturation in both- technological advancements and the consumer market. 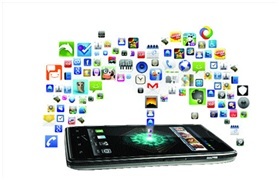 The only sector which has been witnessing an uninterrupted growth over the years is that of the Mobile Applications. Mobile applications (apps) have been gaining rising popularity due to the advances in mobile technologies and the large increase in the number of mobile users. Consequently, several app distribution platforms, which provide a new way for developing, downloading, and updating software applications in modern mobile devices, have recently emerged. 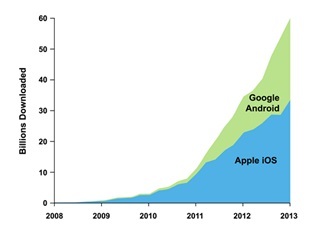 Google’s Android and Apple’s IOS add up to more than 90% of the Smartphone sector and have the largest app-stores in terms of products and their reach. 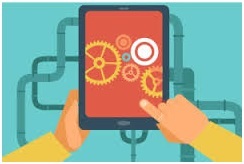 Developing apps for mobile devices requires considering the constraints of these devices. Mobile devices run on battery and have less powerful processors than personal computers. Developers also have to consider a lengthy array of screen sizes, hardware specifications and configurations because of intense competition in mobile software and changes within each of the platforms. Once these prerequisites are fulfilled the app is ready for the next stage. Apps provide revenue opportunities through advertisements and payments through customers and the app development kits available online makes it even more easier for a normal person to implement his idea and share it with the world through the means of his/her app. 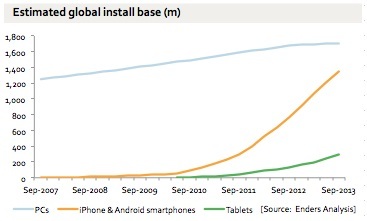 However this ascent within the app world did not take place overnight. There are a number of factors behind this dramatic rise in the app development and distribution sector. Increase in the number of Smartphones: The number of Smartphones in use has increased exponentially and will probably pass the number of PCs on earth in the first half of 2014 and will surpass the human population in terms of number in the coming years. The average age for the first cell phone has come down to 13 and is 17 for the first smartphone. 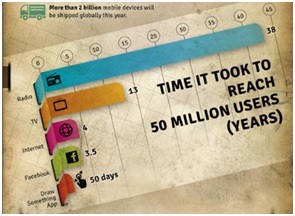 These statistics show the usage of phones in the age-group that contributes the maximum to the population. Moreover, an average human being spends almost 80% of his mobile time on apps thus indicating the importance of apps in the usage of a consumer. A large number of app distribution platforms have emerged in the recent times, thus providing the developer a fine choice of different consumer communities and various marketing avenues. With the Google play store being a home to over 1 Million apps and having completed 25 Billion downloads within 4 years of its inception, marketing your app has never been easier. But not all types of apps have witnessed the same response. 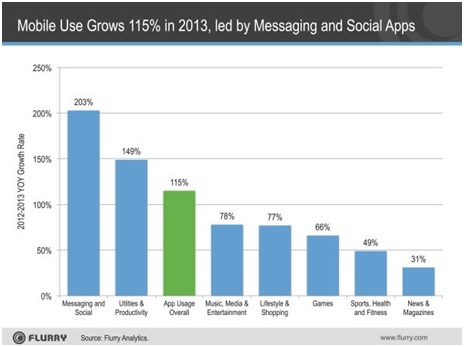 Messaging and social apps have witnessed the largest increase in terms of both- number of products and download per product owing to the ever socialising world. Moreover the increasing number of features like- free text messaging and video calls ensure that these apps remain the dearest to this social animal. However, growth does not equal engagement. While a robust app market definitely is good news for mobile developers, downloads do not necessarily equal user engagement, which is a whole another ball of wax. 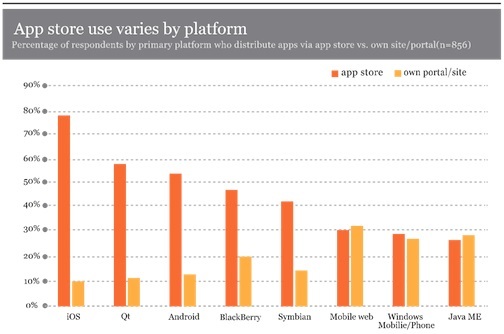 Judging from the sheer amount of downloads from various app stores (numbering in the billions just from Apple alone); people are obviously very willing to try new apps. However, it is a good idea for developers to take a long-view picture beyond just that initial download and figure out how they can focus on retaining those customers, making them into die-hard fans who will continue to use the app for the long haul. Looking at the statistics and the current trends, it will be exciting to see how the developers are able to maintain this surge and what the coming years have in store for us.